Strangford Lough - Position on map and denomination 5. About Strangford Lough, please, read reverse description! 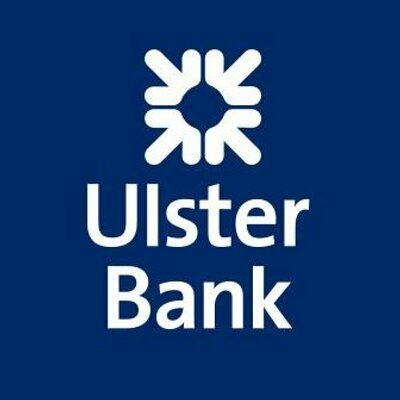 Bank logo of Ulster Bank - Daisy wheel. 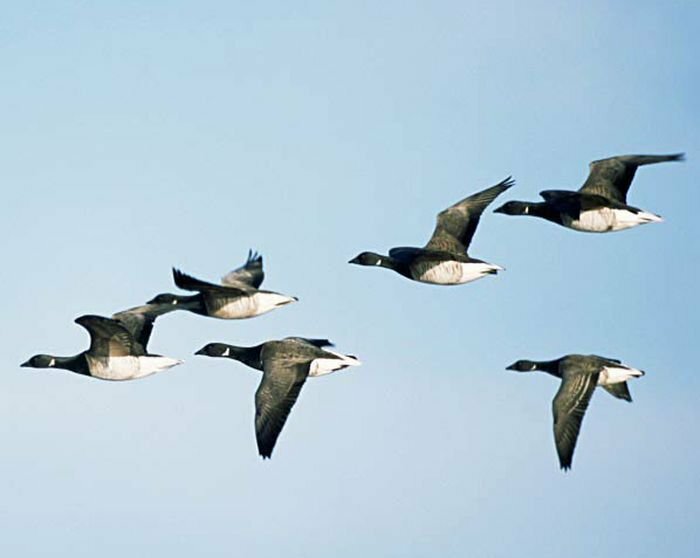 On top is the flying flock of Brent geese. The brant is a small goose with a short, stubby bill. It measures 55-66 cm. (22–26 in.) long, 106-121 cm. (42-48 in.) across the wings and weighs 0.88-2.2 kg. (1.9–4.9 lb.). The under-tail is pure white, and the tail black and very short (the shortest of any goose). Fuchsia is a genus of flowering plants that consists mostly of shrubs or small trees. The first, Fuchsia triphylla, was discovered on the Caribbean island of Hispaniola (Haiti and the Dominican Republic) about 1696-1697 by the French Minim monk and botanist, Charles Plumier, during his third expedition to the Greater Antilles. He named the new genus after German botanist Leonhart Fuchs (1501-1566). Fuchsias are popular garden shrubs, and once planted can live for years with a minimal amount of care. The British Fuchsia Society maintains a list of hardy fuchsias that have been proven to survive a number of winters throughout Britain and to be back in flower each year by July. Enthusiasts report that hundreds and even thousands of hybrids survive and prosper throughout Britain. In the United States, the Northwest Fuchsia Society maintains an extensive list of fuchsias that have proven hardy in members' gardens in the Pacific Northwest over at least three winters. Near the fuchsia is butterfly Cryptic Wood White (Leptidea juvernica). Wing span: Medium-sized, 36-44 mm. (1.42–1.73 in.). 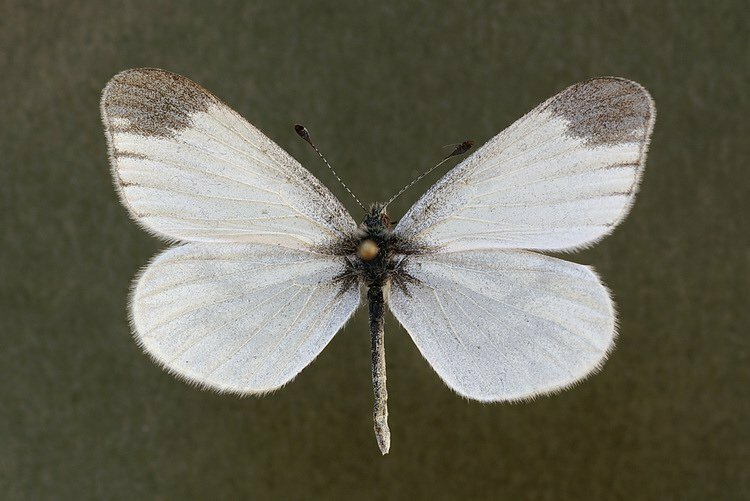 Wing upper side: White, forewing tip grey or black. Wing underside: Light yellow, light green and light grey as patches. Habitat: Forest edges and clearings. Flying time: Early May-late June. Larval foodplant: Meadow vetchling (Lathyrus pratensis), tufted vetch (Vicia cracca), bush vetch (V. sepium) and also other Pea family (Fabaceae) plants. 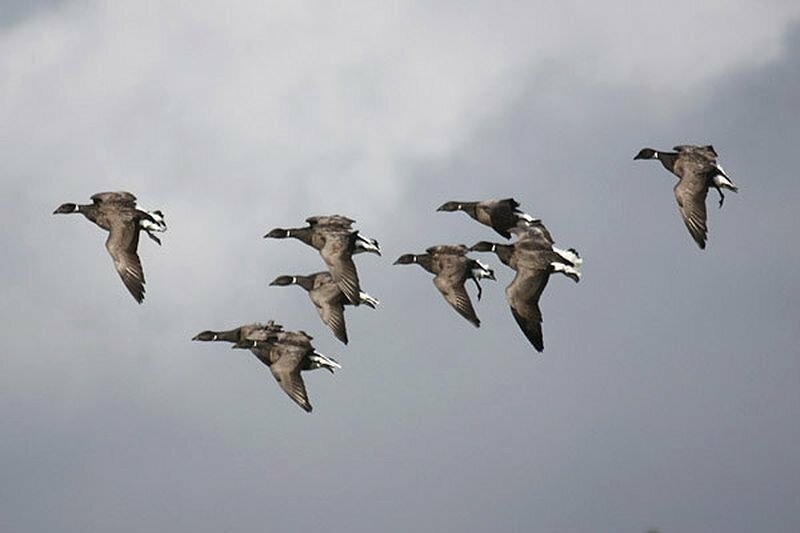 On top is, again, the flying flock of Brent geese. 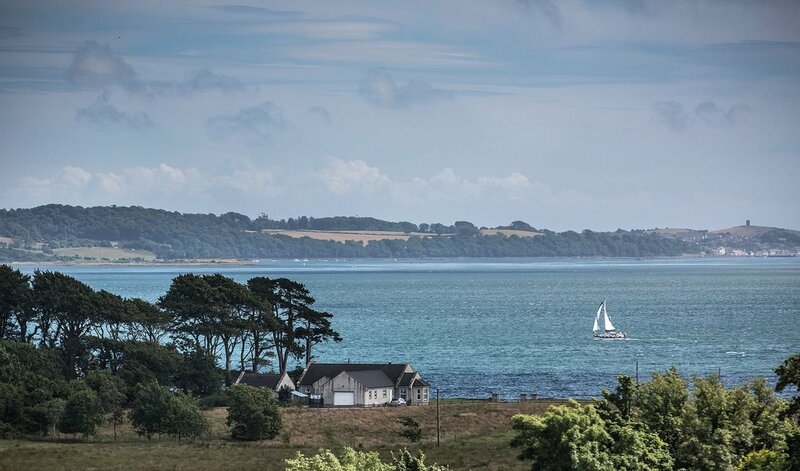 Strangford Lough (from Old Norse Strangr Fjörðr, meaning "strong sea-inlet") is a large sea loch or inlet in County Down, in the east of Northern Ireland. It is the largest inlet in the British Isles, covering 150 km2 (58 sq mi.). The lough is almost totally enclosed by the Ards Peninsula and is linked to the Irish Sea by a long narrow channel at its southeastern edge. The main body of the lough has at least seventy islands along with many islets (pladdies), bays, coves, headlands and mudflats. Strangford Lough was designated as Northern Ireland's first Marine Conservation Zone (MCZ) under the introduction of the Marine Act (Northern Ireland) 2013. It has also been designated a Special Area of Conservation under the EU Habitats Directive, and its abundant wildlife is recognised internationally for its importance. In the medieval and early modern period Strangford Lough was known in Irish as Loch Cuan, meaning "sea-inlet of bays/havens". 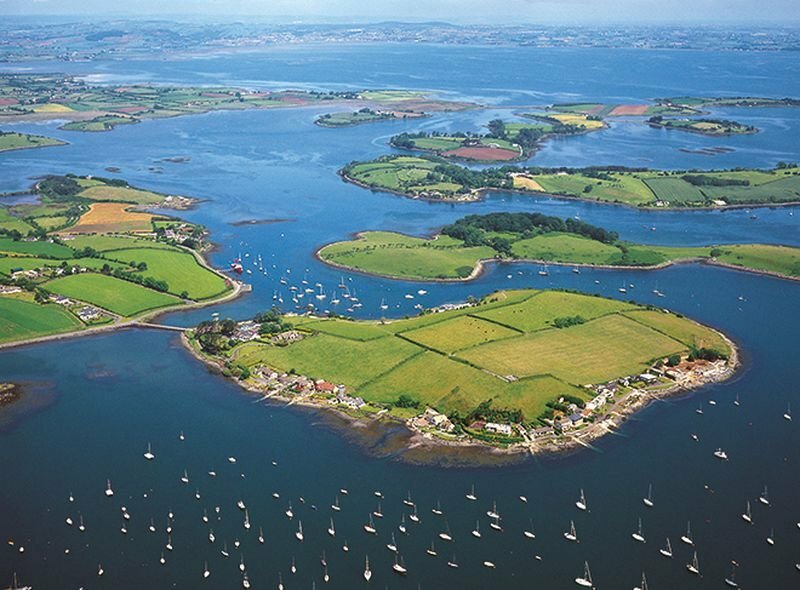 Strangford Lough is a popular tourist destination noted for its fishing and scenery. Towns and villages around the lough include Killyleagh, Comber, Newtownards, Portaferry and Strangford. The latter two straddle either shore of the narrow channel connecting the lough to the Irish Sea, and are connected by a car ferry. The name Strangford comes from Old Norse Strangr-fjörðr, meaning 'strong sea-inlet'. The Vikings were active in the area during the Middle Ages. Originally, this name referred only to the narrow channel linking the lough to the sea (between the villages of Strangford and Portaferry). Up until about the XVIII century, the main body of the loughh was better known by the (older) Irish name Loch Cuan, meaning "loch of the bays/havens". This name was anglicized as Lough Coan, Lough Cone, Lough Coyn, Lough Coin, or similar. The narrow channel may have been known in Latin as the fretum Brene. In Ulster-Scots the lough's name is spelt Strangfurd or Strangfirt Loch. Ptolemy's Geography (II century AD) described a point called Ουινδεριος (Winderios, "pleasant river") which may have referred to Strangford Lough. The loch was formed at the end of the last ice age and is generally under 10 m. deep. 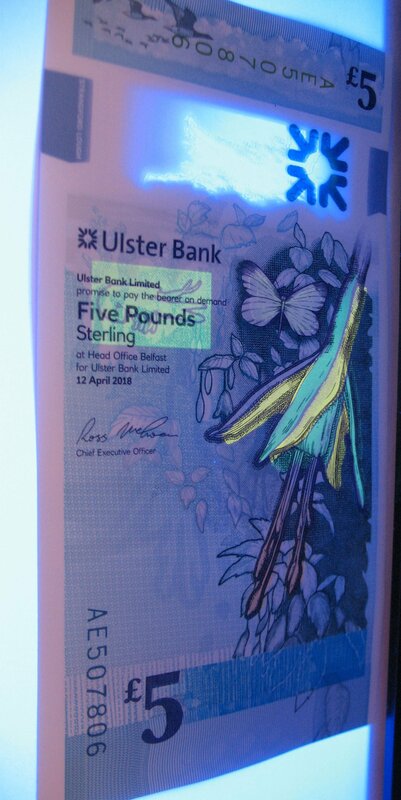 The blue 5-pound note focuses on Northern Ireland as a place that people pass through and visit, highlighting the importance of the sea and migration. People running down the beach, which poignantly represents the country’s history of migration and family separation, as many Northern Irish people moved to America and Glasgow in the XXth century. Then, when a UV light is shone on the note, another set of people appears, which looks to represent these families coming back together, again, as this period has passed. The notes also feature culinary delights associated with the north Ireland. On 5 Pounds it is The King scallop (in lower right corner). Pecten maximus, common names the great scallop, king scallop, St James shell or escallop, is a northeast Atlantic species of scallop, an edible saltwater clam, a marine bivalve mollusc in the family Pectinidae. This is the type species of the genus. This species may be conspecific with Pecten jacobaeus, the pilgrim's scallop, which has a much more restricted distribution. The shell of Pecten maximus is quite robust and is characterised by having "ears" of equal size on either side of the apex. The right, or lower, valve is convex and slightly overlaps the flat left, or upper, valve, which is flat. Larger specimens have an nearly circular outline and the largest may measure 21 cm in length. The "ears" are prominent and are a minimum of half the width of the shell with the byssal notch situated in the right anterior ear being slight and not serrated. The sculpture of the valves is distinctive and consists of 12 to 17 wide radiating ribs and numerous concentric lines which clearly show the scallop's growth history, while the "ears" show a few thin ribs which radiate from the beaks. The radiating ribs reach the margins of the valves and this creates a crenulated form. The left valve is normally reddish-brown while the right valve varies from white through cream to shades of pale brown contrasting with pink, red or pale yellow tints; either valve may show zigzag patterns and may also show bands and spots of red, pink or bright yellow. 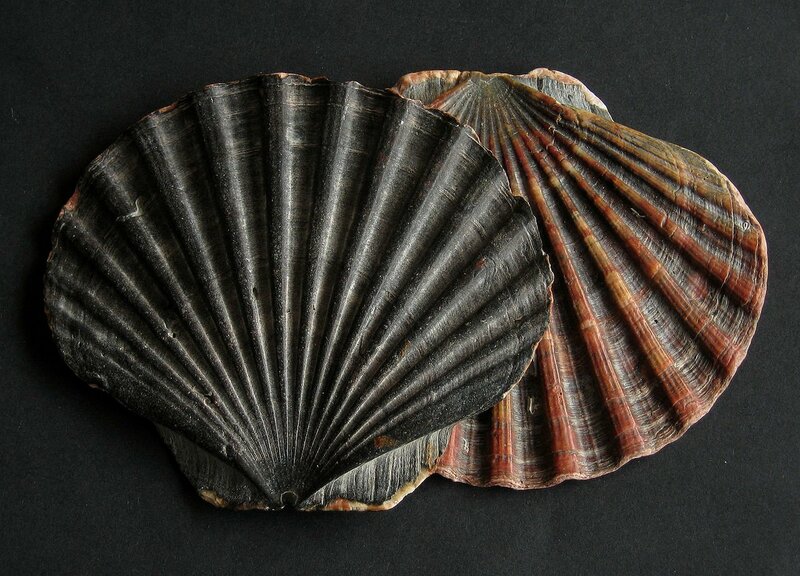 The colour of the body of Pecten maximus is pink or red with the mantle marbled brown and white. When young they are attached to the substrate by a byssus but mature animals are capable of swimming by the opening and rapid closing of the valves. The adductor muscle which is used to close and open the valves is very large and powerful. The foot is a finger-like organ, which spins the byssal threads, which pass through the byssal notch on the ears. The margin of the mantle has two layers the inner layer is finely fringed while the outer is lined with long tentacles with two series totalling 30-36 dark blue or green simple eyes or ocelli in two rows at their base. Pecten maximus occurs in the eastern Atlantic along the European coast from northern Norway, south to the Iberian peninsula, it has also been reported off West Africa, off the Macaronesian Islands. In Great Britain and Ireland it is distributed all round the coast but it is uncommon and localised on the eastern North Sea coast. It prefers offshore waters down to 100 m.
Different textures feature on the notes for security purposes, and these are also related to the country’s geology – a greywacke sandstone texture features on the £5. Greywacke or graywacke (German grauwacke, signifying a grey, earthy rock) is a variety of sandstone generally characterized by its hardness, dark color, and poorly sorted angular grains of quartz, feldspar, and small rock fragments or lithic fragments set in a compact, clay-fine matrix. It is a texturally immature sedimentary rock generally found in Paleozoic strata. The larger grains can be sand- to gravel-sized, and matrix materials generally constitute more than 15% of the rock by volume. 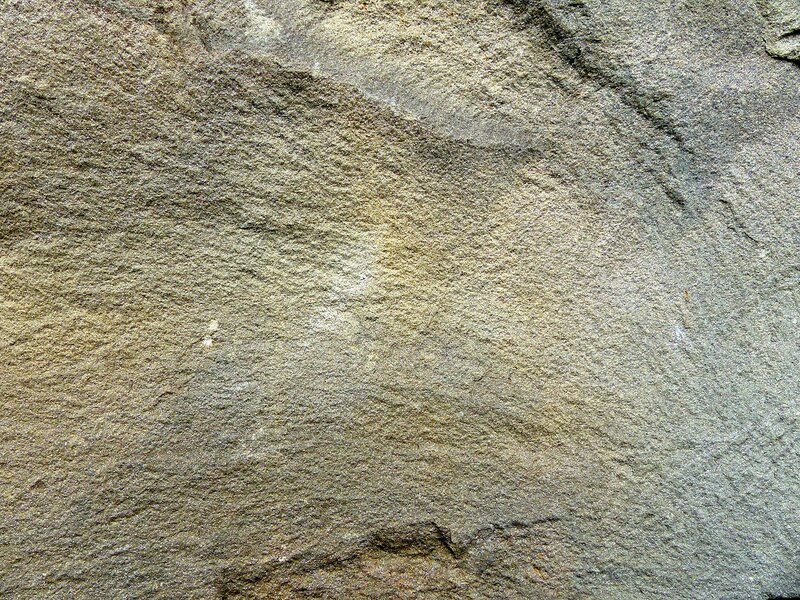 The term "greywacke" can be confusing, since it can refer to either the immature (rock fragment) aspect of the rock or its fine-grained (clay) component. The origin of greywacke was problematic until turbidity currents and turbidites were understood, since, according to the normal laws of sedimentation, gravel, sand and mud should not be laid down together. Geologists now attribute its formation to submarine avalanches or strong turbidity currents. These actions churn sediment and cause mixed-sediment slurries, in which the resulting deposits may exhibit a variety of sedimentary features. 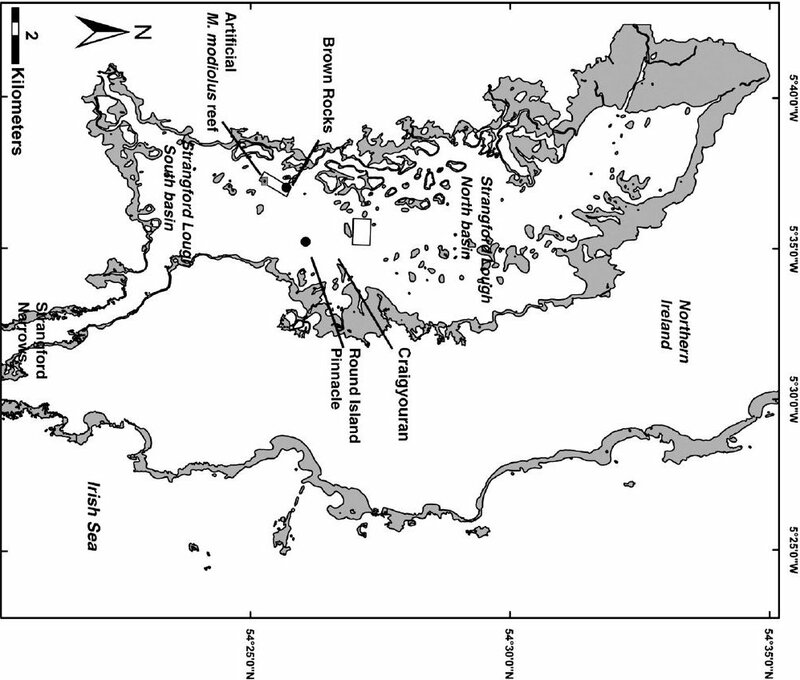 Supporting the turbidity current origin theory is that deposits of greywacke are found on the edges of the continental shelves, at the bottoms of oceanic trenches, and at the bases of mountain formational areas. They also occur in association with black shales of deep sea origin. Greywackes are mostly grey, brown, yellow or black, dull-colored sandy rocks which may occur in thick or thin beds along with shales and limestones. They are abundant in Wales, the south of Scotland, the Longford Massif in Ireland and the Lake District National Park of England; they compose the majority of the main alps that make up the backbone of New Zealand; sandstones classified as feldspathic and lithic greywacke have been recognized in Ecca Group in South Africa. They can contain a very great variety of minerals, the principal ones being quartz, orthoclase and plagioclase feldspars, calcite, iron oxides and graphitic, carbonaceous matters, together with (in the coarser kinds) fragments of such rocks as felsite, chert, slate, gneiss, various schists, and quartzite. Among other minerals found in them are biotite, chlorite, tourmaline, epidote, apatite, garnet, hornblende, augite, sphene and pyrites. The cementing material may be siliceous or argillaceous and is sometimes calcareous. As a rule greywackes do not contain fossils, but organic remains may be common in the finer beds associated with them. Their component particles are usually not very rounded or polished, and the rocks have often been considerably indurated by recrystallization, such as the introduction of interstitial silica. In some districts the greywackes are cleaved, but they show phenomena of this kind much less perfectly than the slates. Some varieties include feldspathic greywacke, which is rich in feldspar, and lithic greywacke, which is rich in tiny rock fragments. Although the group is so diverse that it is difficult to characterize mineralogically, it has a well-established place in petrographical classifications because these peculiar composite arenaceous deposits are very frequent among Silurian and Cambrian rocks, and are less common in Mesozoic or Cenozoic strata. Their essential features are their gritty character and their complex composition. By increasing metamorphism, greywackes frequently pass into mica-schists, chloritic schists and sedimentary gneisses. The UK is increasingly becoming a cashless society – people are now able to tap away on contactless card readers on public transport, in bars, restaurants and pretty much anywhere. The use of physical money is naturally declining. Research from UK Finance conducted earlier this year found that debit cards are set to overtake cash as the most frequently used payment method in the UK. No doubt the appeal of paying with card is not only its convenience but also security and the ability to track spending at every point. But while we still have coins and notes, banks across the UK are concentrating efforts on introducing more secure currency, which is harder to counterfeit – as well as implementing thoughtful designs that resonate with the public. The Bank of England is not the only UK bank to do this. 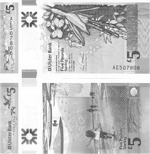 While English currency might be the most widely circulated, Scotland and Northern Ireland also produce their own bank notes, which can be used across the UK. 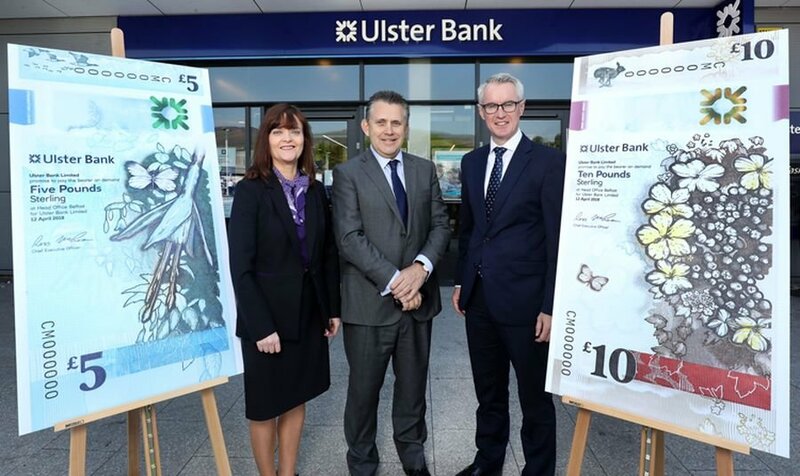 Ulster Bank in Northern Ireland is set to release polymer £5 and £10 bank notes, which are made of polymer like the recently-released English and Scottish ones, and have a vertical design. The notes have been designed by Edinburgh-based service design consultancy Nile, in collaboration with creative directors Lisa Smith and Colin McCadden, and several Northern Irish illustrators and photographers. They feature plants, animals and themes that relate to the country. Type foundry Fontsmith worked on the typography, while Glasgow-based design studio O Street worked on the graphics and banknote manufacturer De La Rue worked on security features and printing. Jeni Lennox, associate principal at Nile, says that the decision to take on a vertical format was based on a few reasons, including breaking tradition and allowing more space for illustrations. “Also, notes are handled both ways round nowadays, particularly when being fed into machines, so we wanted to acknowledge this,” she adds. She adds that the designs aim to be “honest, realistic and celebratory” of Northern Ireland’s characteristics and quirks, and that the studio wanted to avoid clichés associated with the country. Nile redesigned the Scottish notes in 2016 and 2017, and avoided “castles and tartan” for the same reason, she says. From this way of thinking came the idea of representing the decline of segregation in Northern Ireland – namely between those who belong to the Roman Catholic and Protestant churches – and how, while divisions are still an issue, political tensions have gradually improved over time. 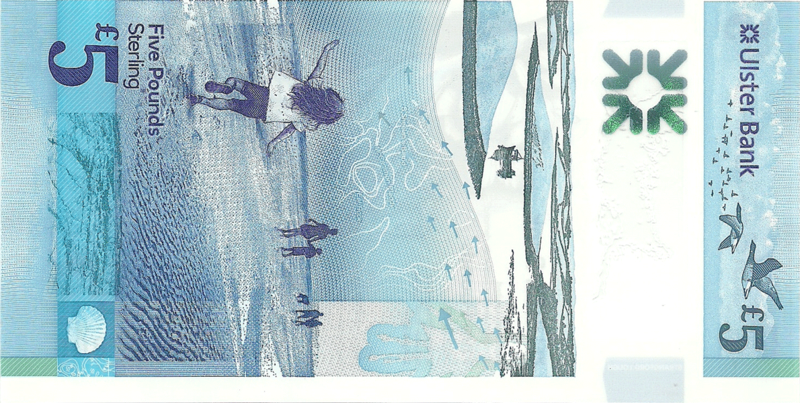 The £5 note is themed around migration of animals and people, and features native creatures and plants on the front, including the Brent goose and the fuchia flower. Hedges also feature, which aim to represent the idea of “porous dividers”, and symbolize divisions between different communities breaking down, says Lennox. The back features the Strangford lough sea loch found in County Down, east Northern Ireland, as well as people running down the beach, which poignantly represents the country’s history of migration and family separation, as many Northern Irish people moved to America and Glasgow in the 20th century. 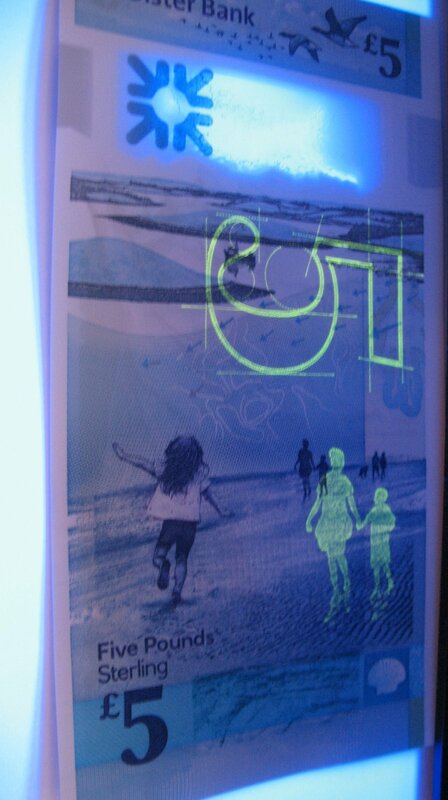 Then, when a UV light is shone on the note, another set of people appears, which looks to represent these families coming back together again as this period has passed. 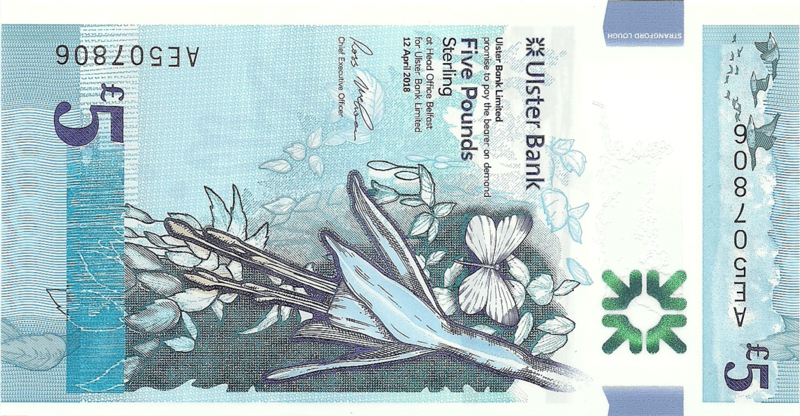 The £10 note is themed around growth, and celebrates Northern Ireland’s traditional food and indigenous plants and animals, featuring a guelder-rose on the front alongside an Irish hare. The back features an Ulster glade potato, which only appears under UV light, and hedge row fields across which ploughs are being pulled for farming. Different textures feature on the notes for security purposes, and these are also related to the country’s geology – a greywacke sandstone texture features on the £5, while carboniferous limestone features on the £10. Both notes have a “botanical” theme, and the colour palette broadly follows UK restrictions for currency, which are blue and green for £5 notes and brown for £10 notes. The studio will also be designing a £20 and £50 note, which will take on more of an “urban” theme, while the £5 and £10 notes are more “rural”, says Lennox. The design team employed a roster of Northern Irish creative people to work with. Botanical and plant-based illustrations were created by Abigail Bell, while illustrations of people and other features were created by Peter Strain. Some features were also based on work by landscape photographer Chris Hill. The note designs are also pertinent given the UK’s decision to leave the European Union (EU) – the fact that Northern Ireland voted to remain was an important consideration, Lennox adds. 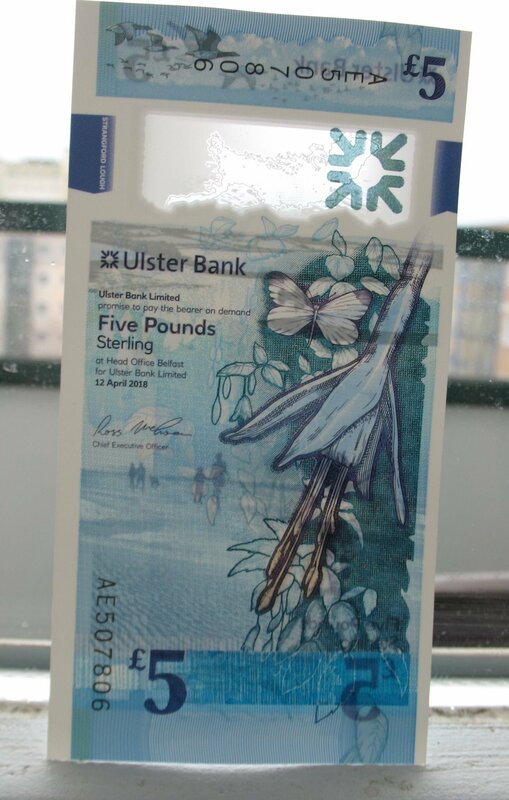 While these notes are produced by Ulster Bank, they will be available to use anywhere in the UK – and part of the project was also about stressing how much the country provides for the UK overall.